The history of Virginia City, Montana is important to the State of Montana and to its residents because Virginia City was the birthplace of Montana and the cradle of much Montana and United States History. The history of Virginia City, Montana is important to the entire United States because strategic events were worked out in Virginia City during the Civil War. That History begins on 16 June 1863 with the registration of the town site of the new settlement as “Verona”, their spelling of Varina, the wife of the President of the Confederate States of America. Virginia City began as Varina, in Idaho Territory, truly a Rebel town in Union territory during the Civil War. The gold produced in Virginia City was strategic to the Civil War, which was being fought while the new city was being founded. The issue was the control of that far-away gold producing territory, either by the South, who had the majority of citizens, or by the North, whose land it was. With a beginning like that, it is no surprise that the early history of Virginia City is filled with lawless conflict. The lack of documentation results in extensive historic disagreement. What really happened in those formative and important Civil War years is still unfolding in a dramatic and stirring series of confusing revelations, as new information is discovered. Virginia City, Montana was (literally) a lawless town. A group composed largely of Masons, Republicans and Northerners formed a secret society of Vigilantes. They strangled (“hung” is not accurate) mostly non-Masonic Democrats with Southern sympathies. Later, probably fearing prosecution, these men had three books written to argue their case, and they also founded the Montana Historical Society, probably for the same purpose. Montanans, and citizens of Virginia City, Montana are loud and adamant that the Vigilantes were necessary in order to free the area of the highwaymen. Strong measures were required because the Sheriff was the secret leader of the Road Agents. Evidence points elsewhere. Sort of. Please look at all the evidence and help us find more. There is plenty for you to do when you travel to Virginia City, Montana and nearby Nevada City. See an old time play at the Opera House summer theater. You can pan gold or rubies (garnets). You can explore, and even meet the local kids. You can learn how to be a gold panner in Virginia City, Montana, especially down by Nevada City at the River of Gold. 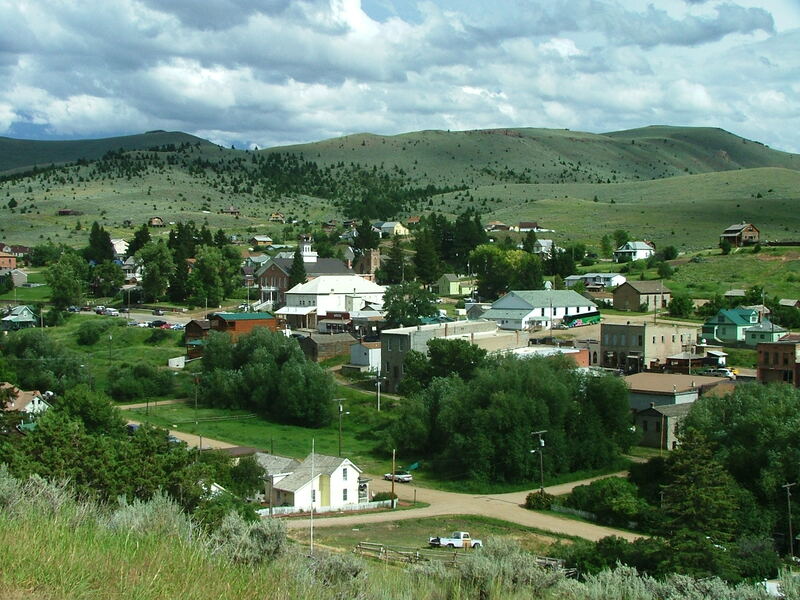 Virginia City, Montana is an exciting old west place for a family vacation. Also, there is interesting stuff here if you want to know about the Civil War. So, welcome to our not-so-ghostly ghost town, Virginia City, Montana. This is the new (to us – it’s an antique) Baldwin locomotive that will steam between Nevada City and Virginia City. We took a year to rebuild the roadbed for this beauty. You can see all kinds of trains and engines, and ride on our train. You get to ride free with your parents. Please check the schedule for the steam train. It only runs on special occasions. Fish?? Some people don’t like to eat them, but they are fun to catch. We have big trout, here in our mountains. The kids’ fishing derby was won by an eight pounder last year, and by a thirteen pounder a few years ago. The winter one was taken by a thirteen ouncer. How big will yours be?? Be careful. This kid hooked on and then her Dad yelled at her to stop walking so close to the water. She yelled back, “I can’t stop, Dad, the fish is pulling me into the lake”. During the Civil War years, when Virginia City was founded as Varina (after the wife of the Rebel president) in Idaho Territory, people shot it out constantly all over town. It was not a safe place to live or visit. But we have to tell you, there were no “great gun slingers”. In fact, these boys were such bad shots that the “enemy” was usually unhurt, but dogs and innocent store customers were killed by mistake. Sometimes we do shootouts on the street. Don’t the folks behind look scared? No, I don’t think so. If you can’t shoot ’em, hang ’em. Hangings really happened, right here. The Vigilantes hung a couple dozen bad guys and managed to slow down all the shooting in town. This guy is just an actor. I think he survived. Maybe you don’t go for hangings and shootings. How about gold?? You will certainly get some of that here. Be sure to pan your own. I have some I panned back in 1947 hanging around my neck. When you leave the Park, at Madison Junction go out the West Entrance to West Yellowstone. Be sure to visit the habitat of living grizzly bears, in case you didn’t see any on your way across the “High Country”. Then head north on Route U.S.287 to Earthquake country and you are on your way to Virginia City, Montana. Just before midnight on Monday, 17 August, 1959, one of the most severe earthquakes ever recorded on the continent of North America shook sleepers awake for hundreds of miles around the Virginia City area. Drivers found the road in front of them suddenly disappeared, the water in Hebgen Lake sloshed over the dam at the west end in a wall two stories high. The water rushed down the Madison River drowning campers and vacationers. Near the opening of the Madison River Canyon into the beautiful Madison River Valley (which you will follow north to Virginia City, Montana) the entire side of a mountain crashed down into the canyon, burying campers along the river. The cascading rock crushed itself and flowed like water up the other side of the canyon, where it remains today for you to drive up to – it is a frozen wave of once solid rock, now crushed by the forces of nature. The wave of rock dammed up the Madison River and created “Quake Lake”. On top of the wave of crushed rock sits the earthquake museum. It is well worth your visit. When you arrive at Hebgen Lake and pass by its dam, you will soon come to Cabin Creek. Be sure to turn north into the earthquake display. This was the old Cabin Creek Camp Ground. All day long on 17 August 1959 this camp ground was level and extensive. Now you see before you the gradually eroding wall of the “scarp”, the actual crack or “fault” on which the back area of the camp ground rose twenty feet above the level you are standing on. On the weekend there had been a meeting of earthquake scientists in Yellowstone National Park. On this Monday, one of them was camped right here in the Cabin Creek Camp Ground. He was hurled out of bed and knew immediately what was happening. He crawled out of his tent with a powerful flashlight and looked around. He kept being thrown to the ground, but was able to watch as the ground before him rose up into the twenty foot scarp you can see today in its eroding form. Our scientist was fortunate. A boulder the size of a car came crashing down the mountain side and smashed across his sleeping bag! After visiting the Earthquake Museum you will drive on west towards Virginia City, Montana. “CELL PHONE WARNING” You are in the mountains. Cell phone reception is spotty. Virginia City, Montana, sits high in the Rocky Mountains about eighty miles northwest of the West Entrance to Yellowstone National Park. It is a living museum, an old west Victorian mining town with most of the commercial part of town preserved so that you can see its architecture and way of life. The museum part of town belongs to the people of the State of Montana. The State is involved in architectural preservation, restoration and interpretation with living history events. You will find it entertaining and interesting. It will make your vacation memorable and educational. Another part of our town belongs to private citizens who are preserving and presenting their own historic homes and buildings. They are a vital part of this remarkable museum town. Reenactment and living history bring alive the Old West. Your experience will be enriched by summer theater, plays, vaudeville and our multitude of events. The vacation traveler will find family recreation with entertainment and education for all the kids, young and old. You can do your own placer mining for gold and garnets and learn about the vigilantes, and how the gold of Virginia City, Montana won the Civil War for the Union. Come and visit Virginia City and nearby Nevada City with your friends, your family or with your school class and your teachers. We would like to entice you to schedule a camp or school field trip to Virginia City where you will find expert guides and a ghost town filled with friendly residents who are not ghosts. Learn first hand how Montana began and how it effects the entire United States. Anyway, come and visit us and learn why all this happened. You know, Mary Ronan (age 14) left school in the afternoon and saw, just a block away, a big crowd. She walked along and then saw, right there on our main street, two blocks from her school, her friend the shoe maker, and her friend the deputy sheriff hanging dead, with three others. Who were they? Why were they hanged? Come and find out.